Martin’s school requires that each parent send lunch and two snacks. This morning, for Martin’s snacks, I packed (1) lime pudding, made from avocado, manuka honey, vanilla extract, and lime juice; and (2) half a pear, sliced and dredged with lemon juice. Last week I posted a picture of a dippin’ plate with carrots, peppers, and pear. The GAPS diet advises that fruit be eaten away from meals, because fruit enzymes work better alone. So, to the extent Martin eats fruit (I try to limit fruit, because he has so much trouble with yeast flares, which can be fed by sugar), I give it as a snack. 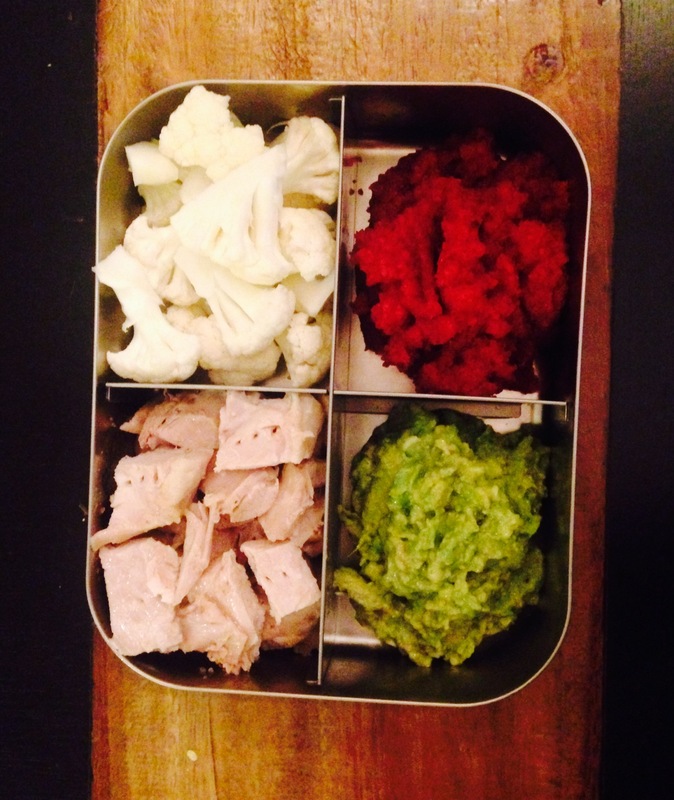 For Martin’s lunch, I packed his LunchBots container with (1) chicken breast with Himalayan pink salt; (2) avocado (I do a lot with avocado) mashed with cultured garlic, which you may remember from the “dippin’ plate”; (3) probiotic Zing! salad; and (4) raw cauliflower florets. I have been trouble getting Martin to eat raw vegetables. That’s a shame. Raw veggies are full of good digestive enzymes, and they might help loosen his front-bottom baby teeth, which I want to do because the adult teeth already have broken through behind them. I predicted the LunchBot would come home with the chicken and avocado gone, the Zing! salad mostly eaten, and the cauliflower untouched. Do I know my son, or what? I was wrong only insofar as he took, maybe, one or two pieces of the cauliflower. Not a total success, but, hey. Some other lunch combinations are bison jerky with homemade probiotic catsup and sauerkraut; chicken-and-egg bread with spread made from sprouted (i.e., soaked overnight before cooking) lima beans, olive oil, and garlic; or the ever-popular “meat and veggies,” i.e., whatever leftover meat is in my fridge paired with whatever fermented veggies are in my fridge. Oh, yes. Before anyone writes it as a comment, I will address what all readers must be thinking right now: Martin’s mom has a real Gwyneth Paltrow thing going on here if she thinks any of this is reasonable. Trust me—I know. I mean, “homemade probiotic catsup”? Who does that? Autism-recovery folks do, I guess. 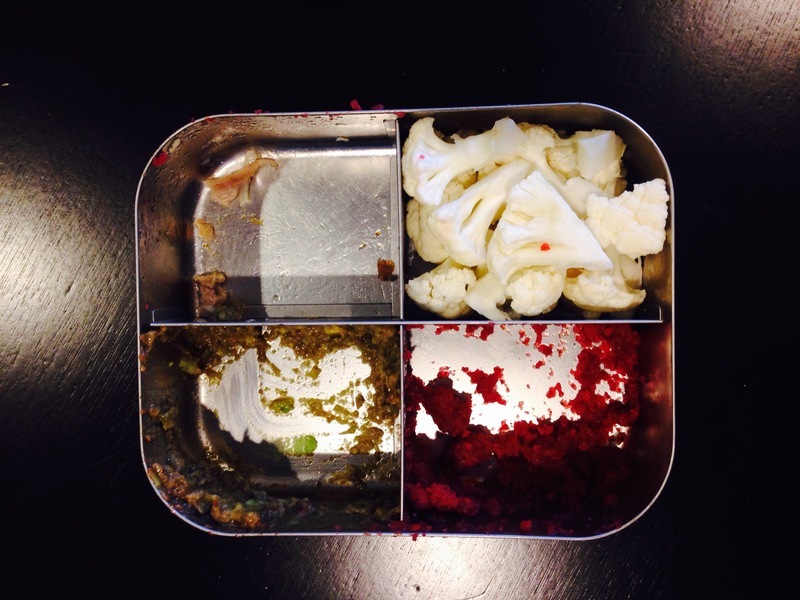 This entry was posted in Diet, Food and tagged ASD, autism, diet, gaps, gaps diet, gaps lunch, gwyneth paltrow, lunchbots, probiotic catsup, probiotic ketchup, recovery, school lunch by findingmykid. Bookmark the permalink. I read other blogs, but I don’t really “follow” any. I will be glad to check yours out and make myself a follower if it will help. What does your agent say about promotion? Does s/he have any ideas? Good luck!